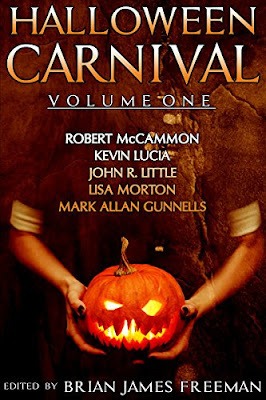 Robert McCammon, Kevin Lucia, John R. Little, Lisa Morton, and Mark Allan Gunnells put the horror back in Halloween with a quintet of devilishly delightful tales, curated by acclaimed author and editor Brian James Freeman. Chocolate bars and sour suckers are trick-or-treat staples, but beware the odd sweet at the bottom of your bag. You never know who it’s from—or what it might do to you. Father Ward should have heeded the warnings about hearing confession on All Hallow’s Eve. Because a man is about to tell him a secret more haunting than any he has heard before. Fear of flying is not uncommon. But on this transpacific airline, the real danger isn’t the flight itself. It’s whoever—or whatever—is up in the air with you. Trick McGrew, former cowboy star of the silver screen, has never believed in tall tales. But down in Mexico, the land of La Llorona, he’s about to find out just how real urban legends can be. Some people will go to any lengths to rack up retweets, likes, and follows on social media, no matter who they end up hurting . . . or even killing. It’s that time of the year again, Where the weather is cooler, leaves change color, pumpkins lined front porches, and people filled stores to search for that perfect costume for their kid to trick-or-treat in, or for themselves to wear attending parties. Halloween. Where we read stories filled with ghosts, ghouls, demons, and monsters. Like Halloween Carnival, Volume 1. If you’re looking for a quick or short read, then this anthology fits the bill. The first story, “Strange Candy,” wasn’t scary to me, as much as truly holding the essence of Halloween. Something Ray Bradbury (who is one of my favorite authors) would have written. A man takes a strange piece of candy found at the bottom of his daughter’s trick-or-treat bag, in the shape of a small hand covered in sugar, and suddenly had to theurge to eat it. Which he did. Suddenly, like Scrooge, he is visited by spirits, by hom going to the place they died, asking him to tell those they’d left behind what happened to them and not to blame themselves. It didn’t scare me, instead, I think it did what the author intended when he wrote it and touched my heart. The second tale is about a priest who hears a confession in the confessional on Halloween. The church was normally closed on that night, but the priest felt the need to keep it open for confessions on that particular Halloween. Even though he might not get anyone, he does when a man fills the small room in the other side of the screen. The man confesses to a guilt that he caused his autistic son, Evan’s death crossing a street and not the drunk driver who hit him. By allowing Evan to cross the street by himself. Except it wasn’t a normal confessional, but this being on Halloween, where the Veil is thinnest and spirits return each year…. #Demon Air” has a young woman named Halle (named for Halloween and not the actress), taking a bargain fare for a plane flight to Australia to find her ancestry after learning she was adopted after the death of her mother. But she will learn that sometimes, the cheapest flight becomes something else when it’s Halloween. The story didn’t do much for me and I felt the ending had no closure. “La Hacienda de los Muertos” is set in Mexico, where instead of Halloween, we get what is celebrated down below the border November, American western movie star, Trick McGraw, in 1958, travels to Mexico City, to work not on a western, but a horror film. The movie would be the first film in six years he worked in, since his horse, Blazer, died. This put me in mind of Roy Rogers and his palomino, Trigger. Not happy to do it, still it is a job and he takes it. Ms. Morton took me back with this story to classic Mexican horror films, where sometimes you might get an American playing a lead part. And when they film the movie on an actual hacienda and another Mexican mythical being, La Llorona, a wailing woman who is looking for her drowned children and causes death to those who encounter her, haunts the nights, making a real-life horror flick for the actors and production company. Trick goes out to stop the ghost from haunting and finds out the truth about her haunting. Not as heart breaking to me as the first two stories in the book, still, it took me back to my childhood, watching these films on TV at night. The last story begins for one town’s Halloween to become one of real terror, when a local horror author posted on his Facebook page about making #HalloweenScaryAgain! Only to maybe get new readers or have people comment, instead someone takes it seriously and the first victim is killed four days before Halloween, #makehalloweenscaryagain scrawled in blue marker across his forehead. Soon, there are other victims, leading up to Halloween and the last victim. Not spoiling for potential readers why the killer is killing, I admit the story felt too cliched, using a horror writer. Though Better than “Demon Air,” this too, disappointed me. Come on, it’s almost Halloween and you want scary fiction to set the mood for you. I think this will be that quick fix you need. I give Halloween Carnival, Volume 1 4 spooky sheep.